South Koreans love new technology. This country boasts the most broadband subscribers in the world, is in the forefront in developing and using e-learning, and has a large population of early adopters. 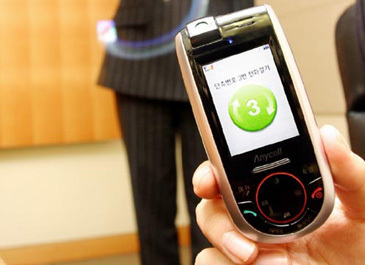 Now two Korean companies vie for the dubious honor of introducing the first mobile phone with motion sensors. On Jan. 12, 2005 Samsung presented the SCH-S310, which uses a six-axis sensor to allow for operations depending on movement. For example, it allows users to make calls by writing the numbers into the air instead of pressing buttons. Samsung is a big mover and shaker in the mobile phone industry, but am I the only one who thinks this is actually a step backwards? If you can press a single button or use voice dialing, isn't that a lot easier than waving the phone around? Only a few days later, Pantech & Curitel introduced the PH-S6500, which uses a 3D sensor as a game interface. On the more practical side, the phone can be used as a pedometer, measuring the walking pace of the person holding it and estimating calories burned. I love a good gadget as much as the next technomaniac, but most of my shiny digital things tend not to disturb other people (my wife is disturbed by my gadget-lust itself, but that is another story). The mobile phone is perhaps the most disputed gadget in the public realm. For years, people have gotten annoyed when mobile phone users talk loudly into their phones, shouting private details to innocent bystanders trying to read on the subway or have a quiet meal in a restaurant. This has lead to a separate market for mobile phone blockers that automatically switches your phone off when you enter a movie theater, for example. This phenomenon of talking in public as if you were isolated from the people around you also led sculptor and performance artist Nick Rodrigues to make a "mobile phone booth" that he puts on in public when speaking on his mobile phone. "By delivering my sculpture to an unsuspecting public, anyone who notices the piece receives a myriad of messages from self deprecating humor to the neglecting of friendship in real time for the hope of something better," Rodrigues says to SensoryImpact.com. If people are annoyed by loud talkers (and ringtones), I wonder what will happen when these motion sensor phones hit the market. I don't think that people frantically waving their phones around is the best thing for crowded Korean malls, subway trains and streets. It is hard enough getting jostled by hundreds of people during rush hour, without being hit with a phone, too. Imagine a young man listening to digital music on his Samsung SCH-S310 on the train. He shakes it twice to the right to go to the next track and punches the woman standing next to him in the stomach. He decides to go back to the previous track and shakes it twice to the left, and suddenly the old man sitting close by is knocked unconscious! 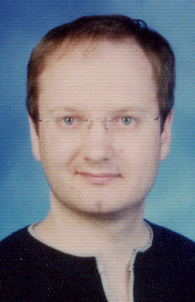 Tore Hogas,who serves as staff writer for The Seoul Times, is based in Seoul working as a freelance writer. As holder of M.A. degree from the Univ. of Tromso he also was an assistant professor of American studies and a university hospital web editor. Hogas has published extensively online since 1995, as well as in print newspapers and magazines, specializing in the arts (literature, film, music). He is also an award-winning short story writer in his native country, Norway.